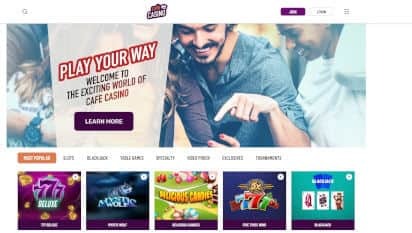 Café Casino 2019 Review - 500% Super Play Bonus! Visit Café Casino Choose Your Bonus! Café Online Casino is licensed by the Kahnawake Gaming Commission. Software providers and casino games are certified by iTechLabs. Safe online payment methods for American and international players. ? All legitimate, real-money online casinos like Café Casino have strict anti-fraud screens, and that may create a short withdrawal delay. It takes up to 72 hours to process withdrawals. You will be able to choose from five different bonuses on the first deposit. The biggest one of the bunch is a 600% match for up to $6,000 for free when using Bitcoin and the Café bonus code CCBITCOIN600. ? Please read the terms and conditions carefully and make sure to take full advantage of the bonus offer. Casino games are supposed to be relaxing. Despite the fact that some sessions can be very tense, especially when large amounts of money are on the line, a visit to your favorite online casino should be made with the goal of relieving stress. With fun games and big bonuses, some operators can definitely create the right environment for users to sit back, relax and also win some nice prizes in the process. Café Casino promises all of this and more. It has a relaxing theme and features more than 260 games on the site. Not to mention that the bonuses are truly massive and can really help players escape their worries when betting. Launched in 2016, Café Online Casino is one of the top sites on the Betting Partners Network. As a result, the operators behind the site have a lot of experience and have proven that they are trustworthy. It also helps to see that the gaming site has received a license from the Kahnawake Gaming Commission. While there are some country restrictions in Europe, players from Canada and from most states in the USA can easily join the casino, make real money deposits, and gamble on the many options available. Withdrawing winnings is simple, although it can take a few days to get the cash in your hands. The online review for Café Casino can be very useful for new players interested in the site. We present the full collection of games and the bonus codes required for the best promotional offers. If you still have questions after going through the presentation, you should know that Café Casino has a pretty good support service that can be used to ask questions and get fast responses. There are two software providers that are working together to make Café Casino a top choice in the United States and in other countries. Real Time Gaming and Rival are both reliable providers that have some impressive slots games. Their combined forces result in a selection of more than 260 gaming options that can be played instantly from the desktop on any computer or desktop. The reason for the 8/10 rating is that the interface could use some work. As it is now, it looks a bit dated. The good news is that it works very well and the games will load quickly every time. Rather than using a lot of flashy elements on the site and in the lobby, Café keeps things pretty simple and very user-friendly. In fact, the lobby is listed on the main page with categories on the left. You can view the entries as a list or as cards. Of course, if you already know what you want to play, you can search for the name through the bar at the top. A no download online casino. Not having to download an application before playing is great. Not only do the games load fast on the site but you won't use up any storage space either. A downloadable version is not available at this time. Betting on mobile devices. A good selection of games can be accessed from your smartphone at any time. Café Casino mobile works on iPhone, Samsung Galaxy, iPad, and other devices with up-to-date browsers. Players at Café Casino are not restricted to their desks when they want to enjoy top-quality games. The website can be opened from any smartphone or tablet. Its interface is simplified but the lobby remains very similar. The list optimized for mobile betting has more than 100 titles, most of which are slots. There are even some progressive jackpots included here, with prizes worth several thousand dollars. From Aztec's Millions and Caesar's Empire to Whale O' Winnings and 8 Lucky Charms, the mobile slots are always good choices. Mobile blackjack, roulette, and video poker are part of the collection as well. Some of the games can have optimized controls when playing from a mobile phone to match the screen display in landscape or portrait view. This makes for easy betting every time. The only drawback to Café mobile casino is the lack of downloadable apps for iOS and for Android. The best solution for connecting quickly would be to add the site to the home screen. When you play for real money on the go, you will continue to earn rewards and bonuses in the same way as when you are playing from home by accessing the same account. There aren&apos;t many online casinos that accept American players and can match the collection of games that CaféCasino.lv offers. Most sites only have a few slots available. However, Café Online Casino goes all out with its long list of slots, table games, video pokers, and specialty games. It gives clients a lot of options and that's always a good thing. On top of that, having all of the titles organized very well makes it easy to locate preferred options and browse alternatives. Despite the good coverage, there are still some things that we found to be missing during the Café Casino review. The most notable is the lack of live casino games, which have become very popular among online players in recent years. On the other hand, the table games look very realistic and can make up for it. The 8/10 rating for games is well deserved and we definitely appreciated that the casino doesn&apos;t limit its selection to slots, even if these options are very often the go-to category. The first category in the lobby is for slots, something which is not really surprising. Most players will head over to these games as soon as they register. Inside, Café Casino combines the best titles from both Rival and Real Time Gaming. There are over 200 entries that cover all the themes you can imagine. Betting limits are favorable for all types of players, with most online slots accepting wagers as small as $0.01 and that can exceed $100 per spin. The game description can offer more information regarding the theme and the available features in every game before you start playing. There is also a practice mode that can be used to play for free. When you find a game that fits your requirements, you can start playing it straight away or check the description first. Once you decide to play for real money, the game screen can be opened on the same page or on a pop-up window. The controls are always convenient and easy to get used to. 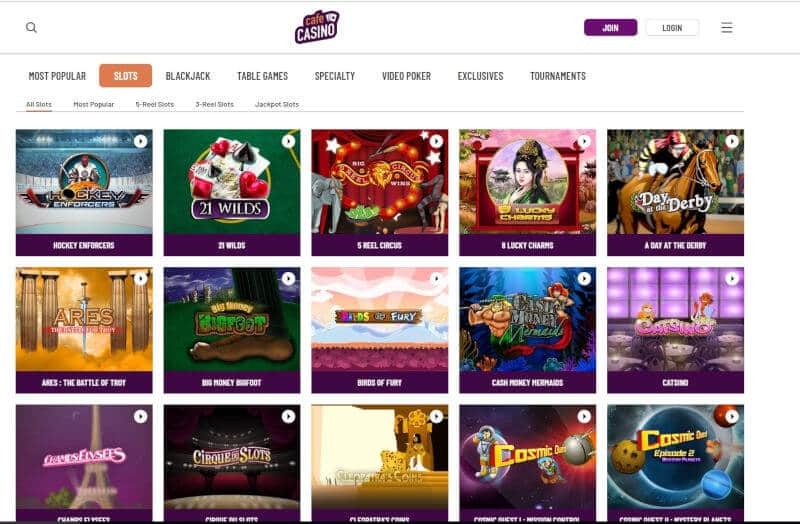 Although the variety of gaming options for the other categories is not as rich as it is for slots, players at Café Online Casino can enjoy plenty of card games, table games, specialties, and video poker machines. Blackjack is covered very well thanks to the many versions. There are also two new titles that present updated graphics for a more realistic experience. As for other table games, American roulette, baccarat, Caribbean hold'em, craps, European roulette, pai gow poker, and tri card poker are all covered. 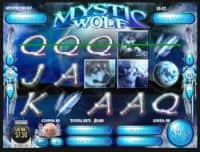 More than a dozen video poker machines make sure that the popular versions are represented well and that players can opt for variants with multiple hands played at the same time. In fact, you can play joker poker with 52 hands per round in order to maximize your potential to win in a short period of time. Similar to blackjack, video poker games have high return to player rates and are loved by many serious players. The list continues with specialty games. These are very easy to play and can offer some nice prizes. You will find several versions for bingo along with keno, Sudoku, scratch cards and other similar gaming options in this category. Although specialty games are not as popular as online slots, they can be good alternatives for short sessions given the almost instant rounds. The lowest rating in the Café review is for banking, which means that this is the section where the online casino can most be improved. Although the system is secure and easy to use, the limited options for deposits and for withdrawals definitely cost the operator. Players can't use web wallets or prepaid cards to add funds. Instead Café Casino accepts payments by debit cards, credit cards, and cryptocurrency wallets. The casino makes it very easy to deposit and withdraw, not to mention that you can claim a huge Café bonus on your first deposit using the famous cryptocurrency. For other options, withdrawals are quite slow and will take more than a week to complete, after the 3-day processing period is up. As a new player at Café Casino, you can choose from five different bonuses on the first deposit. Each offer requires a certain Café bonus code and comes with set terms and conditions. The choice you make should depend on the games you wish to play, the banking option you plan on using, and the size of the transaction. While some of the figures are definitely impressive, we recommend that you read the fine print before playing through a bonus. The funds will be blocked until the wagering requirements are met and some bonuses come with maximum limits for winnings that can result from betting with the free cash. Valid for some games although the wagering contribution rates can vary. Slots count 100%. No maximum limit for winnings. Slots count fully for meeting the wagering requirements while table games only contribute 20%. Winnings exceeding 10 times the deposited amount will be forfeited when cashing out. Available only for the first deposit using Bitcoin. Any winnings over 10x the deposit will be void upon withdrawal. Standard game contribution rates apply for wagering requirements. Available exclusively for the first deposit done via Bitcoin. No max winnings for winnings. Contribution rates: 100% for slots and specialty games, 20% for table games, 10% for video poker and blackjack, 5% for roulette, baccarat, and single deck blackjack. Exclusive bonus for new Café Casino players. Café Casino bonus codes available weekly. Certain games have greater contribution rates than others. You can see that the bonus rating in the online review for Café Casino is of 8 out of 10 despite the impressive offering. The five bonuses make sure that different types of players can get the right offers. However, most bonuses require deposits of $1,000 in order to get the full amount, which is more than the majority of customers can afford to add in one transaction. Also, the wagering requirements are quite steep. 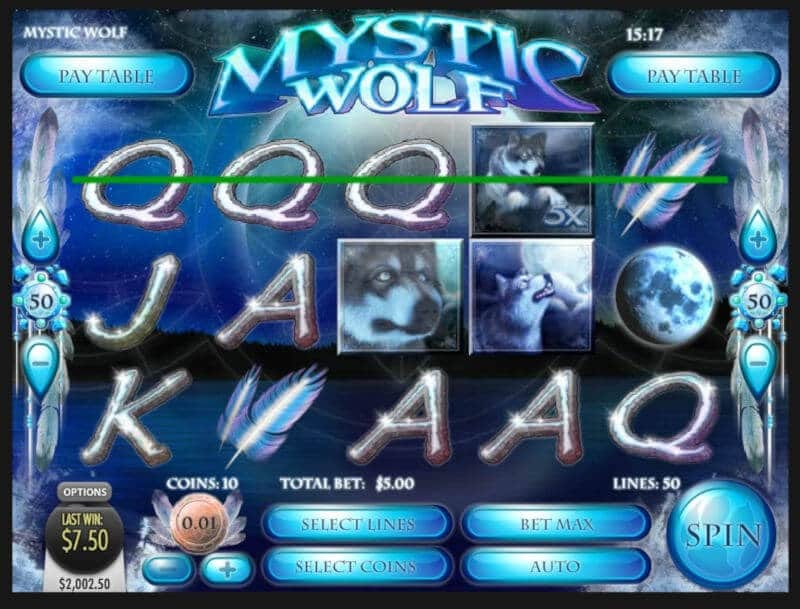 For example, if you get the 500% bonus on a deposit of $100, you will have to bet $7,000 on slots before the amount is cleared and can be withdrawn. Credited after signing up and verifying the account. After settling on one of the big bonuses presented above, you will be able to earn various other rewards. Every bet on Café Casino counts thanks to the unique loyalty program that generates points when putting real money on the line. These points are determined based on the size of the bets and the type of games played. The results of the bets are not relevant so you could potentially win from the spinning reels and get extra rewards from the program. Also, other promotions and bonuses can be claimed as an active player at the online casino. Bet real cash on your favorite games and earn Perk Points automatically. The more you play, the more points you get. Points can be viewed in the account balance and can be redeemed for real money at a starting rate of 2,500 Perk Points for $1. The program has 8 tiers where players can advance by earning more Perk Points. Each level improves the redemption rate for points to money and the cashback bonus available on losses. In addition, members will receive weekly bonuses based on their Perk Tier. For the highest level, you will need to earn 5,000,000 points and you will get a 1,000PP-to-$1 exchange rate along with 18% cash back on losses. Once you are a registered real money player at Café Online Casino, you can tell your friends about the thrilling gaming site and get rewarded for every successful referral. You can send links by Facebook, Twitter and email. For every friend that follows the link and joins with a deposit of $20 or more, you receive $100 in bonus funds. The referred friends can still get the preferred bonuses mentioned in the Café review. Standard terms and conditions for the bonuses apply. Active clients will receive Café bonus offers and promo codes by email every Thursday. The weekly deposit bonus can be claimed as many times as you want. The general terms and wagering requirements are imposed. Games: 200+ Slots including Progressives, 25+ Table Games, 15+ Video Pokers, 20+ Specialty Games, Powered by Real Time Gaming and Rival. Join Café Casino today to get the bonus you like, up to $6,000 FREE!